Wondering how to grow wasabi at home? 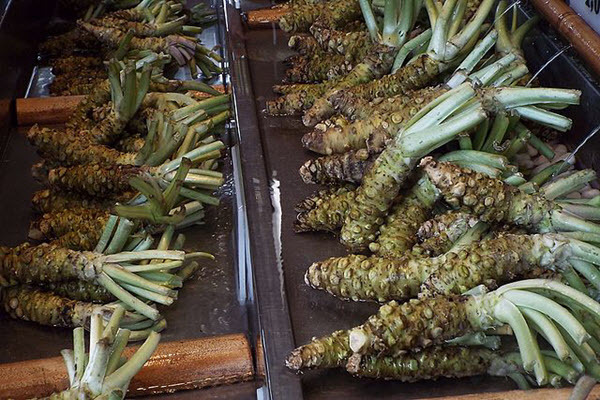 Wasabi is widely considered to be one of the most difficult plants to cultivate and maintain. It is very picky about its environment, temperature, humidity, and water content, and it takes two years to mature and for you to reap the benefits. If you are up for the challenge, read our guide below. Wasabi plants grow best in temperatures that fall between 45°F and 75°F (7°C to 24°C), and they don't take well to large temperature fluctuations. If you live in an area where your year-round day and night temperatures stay within this range, you might be able to grow them without a greenhouse or a grow room. Choose a well-shaded area. This spot shouldn't get direct sunlight because these plants grow on the forest floors in the wild. This means that they should only get enough sunlight to make the leaves grow. It's best to plant under trees, or you can make a shade structure with a tarp or a sheet. Dig up your soil patch with your roto-tiller or your shovel. Till the soil to a minimum depth of ten inches (25 cm). At this point, you want to work in 10 inches (25 cm) of compost to create a very healthy, rich growing soil. Test your soil's pH and adjust it until it's between six and seven. This will ensure that you have the best growing environment possible. Apply your fertilizer as directed by the label and work it into your soil. At this stage, you'll want to ensure that your soil drains well. Water your soil until it's soaked and watch how it drains. If the water is very slow to absorb, work more compost into your soil. 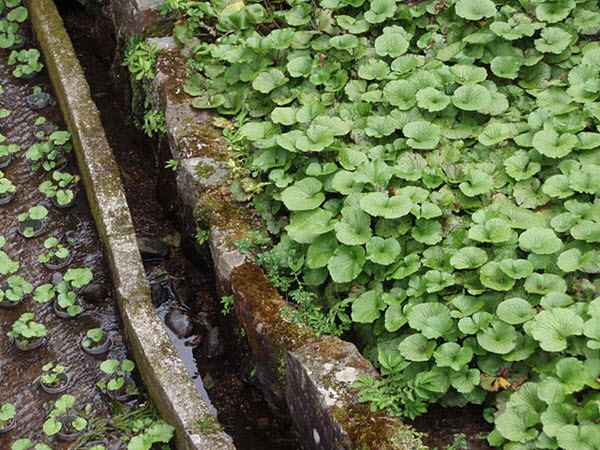 If the water drains straight away, it's ready for your Wasabi. Order your Wasabi seeds late in the fall if you're ordering from online. These are more difficult to find in traditional greenhouses, so online is your best chance. Ordering and planting them in the winter will give them all winter to establish their root systems. Give yourself a 48-hour window to plant them when they arrive. Soak your seeds overnight in a shallow bowl of distilled water to soften the seed shells. This will make it easier for your seeds to germinate. Make rows in your growing patch around 5 to 6 inches (13 to 15 cm) apart. These rows should be 2 inches (5 cm) deep and 2 inches (5 cm) apart. Place one seed per hole and backfill the holes. Water the seeds liberally once they're filled in and gently tamp the earth down. It's very important that you keep your plants moist year-round because they are semi-aquatic plants. If your plants are wilting, they're not getting enough water. If you give them too much water, they can develop root rot. Watch them carefully and adjust your watering system accordingly. Mist your plants or set up a micro-irrigation system. You don't want to soak the soil with a hose or with a watering can constantly because this can lead to fungus growth or root rot, and this can quickly spread to the other plants. Fertilize according to the directions on your chosen fertilizer bag. This could be once a year or not at all, so it's very important to read and test your soil's pH because you have to keep it between 6 and 7 constantly. Weed your patch every other day. Because the soil is so rich, the weeds will sprout very quickly, and they'll compete with your Wasabi for root space. You could even weed every day to be safe. Continue to care for your Wasabi for two years. This is how long it takes to mature and develop its flavor profile. Your plants will be around two feet (61 cm) tall and two feet (61 cm) wide at the end of two years. Additionally, your Rhizomes will be 7 or 8 inches (18 to 20 cm) long when they're ready to harvest. Dig up one rhizome to check that it's ready before you harvest the rest of the patch. Be careful not to cut the rhizomes when you're digging them out. Leave a few plants undisturbed in the soil. They'll self-seed, and you won't have to order more seeds for the next growing season. These seeds should be placed 12 inches (30 cm) apart to stop them from overcrowding and dying off. Clean the dirt off of your rhizomes and remove the leaves. Shave off pieces as you need them. Don't cut ahead of time because or you’ll lose flavor. You can save the rhizomes in the refrigerator for a month or dry them out and grind them for longer storage. Root Rot - Wasabi are prone to root rot if they have too much water. This can spread quickly to the other plants, and you want to pull infected plants quickly. Aphids - Aphids are common with Wasabi, and they eat the plants’ stalks and leaves. Pick them off and use an organic spray to get rid of them. It is a member of the cabbage family. It is packed full of nutrients, vitamins, antioxidants, and minerals. Now that you know how to grow this spicy vegetable root, you can decide if this plant's difficult cultivation process is worth the payoff. Many gardeners claim that it is worth it, and they enjoy the challenge. Here’s a video by Andrew Gardiner who grows them in a greenhouse in pots. And here’s another very informative video of a rare wasabi farm, and how they started the business.